Eastern Idaho Technical College and the Idaho State Board of Education will be holding a ceremony Monday to rename the Technical Building in honor of former president and administrator Bill Robertson. The official naming of the William A. Robertson Building will take place at 1 p.m. Robertson, 67, who retired in 2008, will attend the ceremony. Overall, Robertson served EITC for 37 years. He began in 1972 when, fresh out of college, he was hired as an admissions counselor. In 1978, he was promoted to assistant director of student services, where he presided for the next 18 years. In 1996, he was named the dean of administration, focusing on securing EITC’s financial stability. Also during this time, he served as interim director/president of the college three times – in 1990, 1995-96 and in 2003. 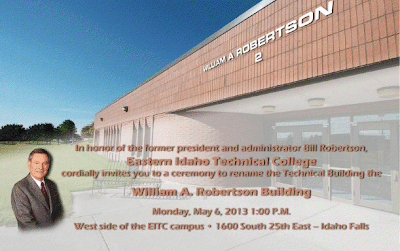 In 2004, Robertson was appointed EITC president by the Idaho State Board of Education. During his tenure at EITC, Robertson oversaw the improvement and expansion ofcampus facilities, including the construction of the Health Care Education building. He was instrumental in developing partnerships with both the Development Company in Rexburg and the Idaho National Laboratory, both of which resulted in substantial contracts and grants for facilities and training. In 2008, Bill led an institutional self-study and successful renewal of EITC’s accreditation with the Northwest Commission on Colleges and Universities. Robertson was a participating member of ECIPDA, Grow Idaho Falls, and served on the board of directors of the Partnership for Science and Technology.